Do you know what’s really going on? – They ( i mean satanists-zionists) so desperately wanted Trump dead that actively using their satanic tricks and techniques to materialize this process. Apparently all of their “decent” ways don’t work anymore ( i mean lying garbage – media and propaganda). Now they dumped out their reserve ( so to say the main and last their chance) to make this thing work for sure.. Monsters! I hope that Trump is not a sucker and he knows how to resist against these things competently..
Now think about that.. if Trump is really this ‘bad- man’ that the media-garbage say about him why do they want him dead so much.. – just ask yourself this simple question. I also want to say that all of these artists-clowns just stupid sheep used by satanists for their personal goals. They are willing to sell your soul to devil just to earn a little more dibs. Griffin joked that she would have to leave the country after the shoot. Need anymore proof that the liberal left has completely passed the point of hysteria an panic, and have now crossed over into dangerous, fascist territory. The liberal left in America are quickly moving towards a fascist ideology that punishes any dissenting voices, especially voices that agree with US President Trump or doubt the Hillary induced Russiagate story. How far will the left go in shutting down and silencing any voices that disagree with atheism, climate change, open borders, shared toilets, and gender fluidity? 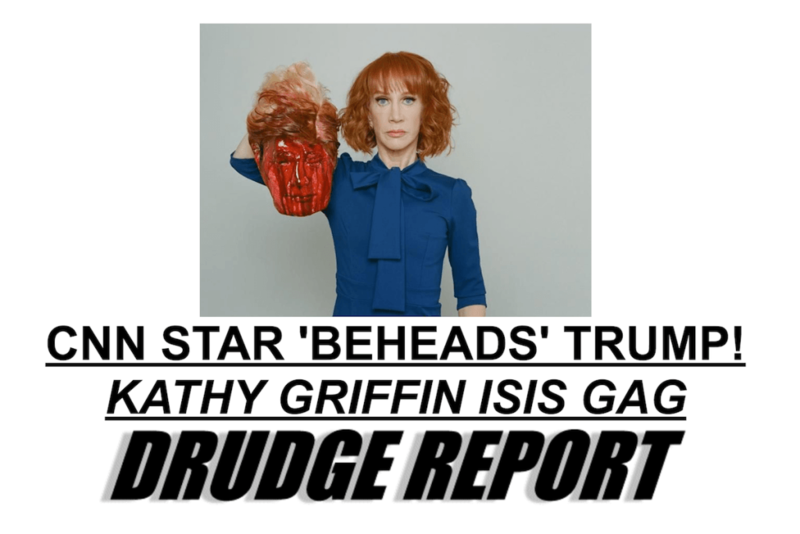 Mimicing the liberal left’s love for ISIS and hate for Trump, CNN host and washed up comedian Kathy Griffin decided to add some shock factor to her dying career by beheading President Trump. Outrage followed from all corners of the political spectrum….from Sarah Palin to Chelsea Clinton. CNN has remained silent, though Griffin’s New Year’s Eve co-host Anderson Cooper tweeted in disgust at Griffen’s photo. Griffen immediately apologized, but any amateur can see she is insincere in her delivery. Fox New’s The Five blasted Griffen’s disgusting display of liberal left “tolerance”. Hey everybody, it’s me, Kathy Griffin.I sincerely apologize. I am just now seeing the reaction to these images.I’m a comic. I crossed the line.I moved the line. Then I crossed it. I went way too far. The image is too disturbing. I understand how it offends people. It wasn’t funny. I get it. I’ve made a lot of mistakes in my career. I will continue. I ask your forgiveness. Taking down the image. I am going to ask the photographer to take down the image. And I beg for your forgiveness. I went too far. I made a mistake and I was wrong. Kathy Griffin has apologized for posting a video of President Trump’s severed head after a furious backlash, sparking the Secret Service into an investigation. The controversial comedian tweeted ‘I am sorry. I went too far. I was wrong’ after Griffin was seen slowly raising Trump’s head during a photoshoot with infamous photographer Tyler Shields. But the apology was not enough to stop the army of critics, both Trump supporters and Democrats from attacking Griffin on social media for the outrageous stunt. Meanwhile, the Secret Service made an oblique reference to the controversy on Twitter, reminding everyone that any threats against the president are taken seriously. ‘We found what she did disgusting and offensive. We are pleased to see she has apologized and asked that the photos be taken down. We are evaluating New Year’s Eve and have made no decisions at this point,’ the spokesman said. Even former first daughter Chelsea Clinton was quick to express her outrage at Griffin tweeting: ‘This is vile and wrong. It is never funny to joke about killing a president. Griffin, an outspoken opponent of Trump who is best known for presenting the New Year’s Eve countdown with Anderson Cooper on CNN, is seen holding the head, which is slathered in fake blood. That’s certainly what happened when the footage and pictures hit the web. The shocking images quickly set social media alight, with many calling for her to be locked up for supposedly ‘threatening’ the president. President Trump’s eldest son Donald Jr. also got in on the act, attacking Griffin for posing with a severed fake head resembling his father, saying it was ‘disgusting but not surprising.